The Hellfire Club Archaeological Project is a not-for-profit project that was created to help to discover the story of Montpelier Hill. Our main objective is to investigate the nature of the possible passage-tombs designated DU025-001001 & DU025-001002 and to obtain a better understanding of both the physical remains of the eighteenth century hunting lodge known as the Hellfire Club, and a better historical insight into the group that made the site so notorious. The excavation of two test trenches in 2016. The Hellfire Club dig was carried out through the month of October, and is now complete. The excavation was directed by Neil Jackman of Abarta Heritage, with an experienced team of archaeologists alongside volunteers from University College Dublin, School of Archaeology. The project is supported by South Dublin County Council, Coillte, Dublin Mountains Partnership as well as Abarta Heritage. With kind support from University College Dublin, the Discovery Programme, the National Monuments Service and National Museum of Ireland. The Hellfire Club Archaeological Project is a not-for-profit archaeological research project. It aims to discover the story of Montpelier Hill through a programme of research and targeted excavation. The project to date has focused on the large mound at the rear of the hunting lodge (known as the Hellfire Club). This feature is recorded in the Archaeological Survey of Ireland as a ‘possible passage tomb‘ (DU025-001001). The tomb was believed to have been destroyed when William Conolly had the stone quarried to build the hunting lodge that later became known as the Hellfire Club. This project was tasked with trying to discover whether the remains of the mound did indeed represent a passage tomb. The project has been carried out over a number of years, and it has included research, geophysical survey, a small programme of test-trenching, as well as the larger excavation of 2016. When the dig was completed, a phase of post-excavation analysis was carried out. This analysis, involving a number of specialists and experts, culminated in this free publication. Who Funded the Hellfire Club Archaeological Project? The project has chiefly been funded by South Dublin County Council as part of the County Heritage Plan, with additional resources from Abarta Heritage. The project was also considerably helped by the assistance of the landowners Coillte and the support of University College Dublin School of Archaeology. The project is not-for-profit and any future phases of the project will be carried out in the same manner. Who Gave Permission for the Hellfire Club Archaeological Project? Permission to carry out the excavation was granted by Coillte, the landowners of the site, and the dig was carried out in accordance with the National Monuments Acts (1930–2004), under licence number 16E0497. The licence was issued to Neil Jackman of Abarta Heritage, by the Minister for Culture, Heritage and the Gaeltacht through the National Monuments Service and National Museum of Ireland. As well as abiding by the National Monuments legislation regarding best-practice, we also ensured we had a clear Health and Safety policy and that we carried out appropriate risk-assessments and took all necessary precautions to safeguard the well-being of the excavation crew as well as the general public. What did the Hellfire Club Archaeological Project Discover? The Hellfire Club dig in 2016 revealed a lot of new information about the site. You can find all of the results in the free digital publication Sacred Skies and Earthly Sinners. The excavation found that the mound at the rear of the Hellfire Club does indeed represent the badly damaged remains of a Neolithic passage tomb. The dig proved that the mound represented the remains of a stone cairn. We can also definitively demonstrate that the tomb had been very badly damaged by quarrying in the 18th and 19th centuries. We also found artefacts consistent with the Irish passage tomb tradition. These artefacts included megalithic art, a polished stone axehead, flint tools and a possible mushroom-headed bone pin. Charcoal samples from the excavation also dated the site to the middle Neolithic period. 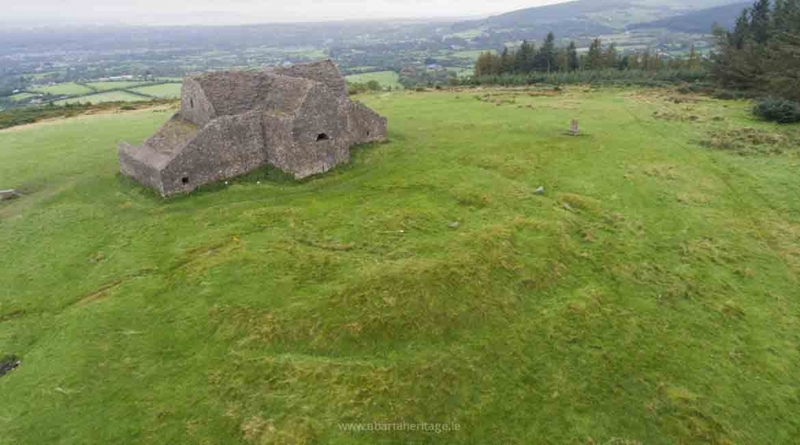 During the research and analysis we also made a number of other interesting discoveries, such as the original name of Montpelier Hill, more on the history of the site and the true story of the infamous Hellfire Club themselves, as well as more on the folklore, myths and legends of this remarkable place. Will there be future phases of the Hellfire Club Archaeological Project? Though the project so far has discovered a lot of information about the site, there is still so much to learn about the archaeology, history and natural environment of Montpelier Hill. This project to date has only focused on one small aspect of the overall story, and it is clear that further research, survey and possibly targeted excavation would be required to gain a more comprehensive insight into the archaeological landscape of this remarkable place. Carrying out a detailed survey of the eighteenth century landscape features and identification of the surviving remains of the deerpark. Conducting a detailed archaeological survey and investigation into the smaller possible tomb, and the large enclosure on the eastern flank of Montpelier Hill. A thorough examination and survey (including laser-scanning and photogrammetric survey of the building). This may help to see if any elements from the passage tomb can be identified. Furthermore, this survey may also highlight any structural issues that the building had and allow for timely conservation intervention. Further targeted excavation of the large tomb to identify the size and shape of the burial chamber. Furthermore, the excavation strategy should also aim to establish if a passageway orientation can be identified. To engage specialists to conduct a palaeoenvironmental study of the Dublin Mountains. The story of the Dublin Mountains could be far better understood if a detailed programme of environmental study was to be undertaken. This may reveal insights on the vegetation history, landscape use and climatic change over the centuries. You can find the detailed recommendations in Chapter 13 of the free digital publication: Sacred Skies and Earthly Sinners (see pages 261 to 264). We hope to establish a steering committee to help to inform and design any future phases of the project. This prospective steering committee will consist of prehistorians, archaeologists, historians with an interest in the eighteenth century, folklorists and other stakeholders. Any future work will be carried out under licence and to best-practice standards. Furthermore, all future phases will continue to be carried out with public engagement and education at the heart of the project. What Was the Hellfire Club? The Hellfire Clubs were founded in the eighteenth century, and were typically comprised of young aristocrats with a shared interest in drinking, debauchery and gambling. The first Hellfire Club was founded in England by the Duke of Wharton in 1719, but it was suppressed by order of King George Ist in 1721. The Irish Hellfire Club was founded in the 1730s, but had largely broken up by the early 1740s as it lost key members through death, bankruptcy and exile. One of the most infamous Hellfire Clubs was established in England by Sir Francis Dashwood in 1755, and nicknamed the ‘Monks of Medmenham Abbey’ as they met in an old Cistercian monastery on the banks of the Thames. By all accounts Dashwood’s version of the Hellfire Club matched its forebears for orgies of debauchery and drunkenness, and they are said to have performed profane versions of Franciscan rites and ceremonies. You can find more information about the history of the Hellfire Clubs here. Who Were the Hellfire Club Members? The Irish Hellfire Club members were some of the elite of society, and included peers of the realm, high ranking army officers as well as wealthy gentlemen and artists. Members included Richard Parsons, 1st Earl of Rosse, Simon Luttrell 1st Earl Carhampton, Lord Santry and the artist James Worsdale. You can find a portrait of the Irish Hellfire Club and more about the members of the organisation and their stories here. What is the Hellfire Club? 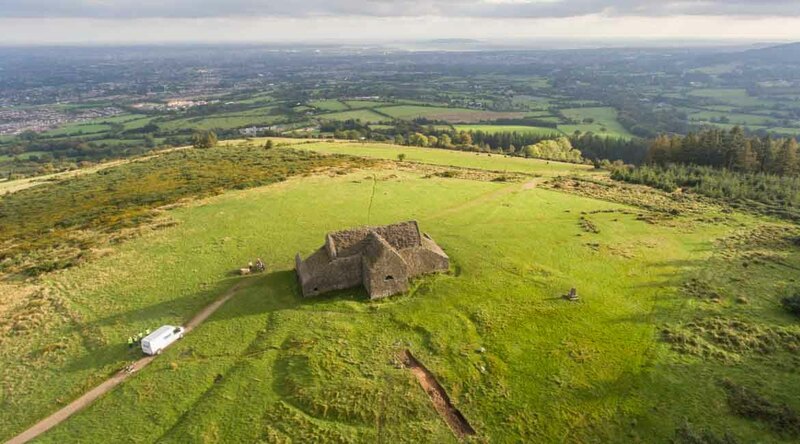 Today the Hellfire Club generally refers to the hunting lodge on the summit of Montpelier Hill, 6km from Tallaght in South County Dublin. You can find more on the story of the building here. To find directions and information on how to get to the Hellfire Club please see here. Where is the Hellfire Club? The hunting lodge, popularly known as the ‘Hellfire Club‘ is located on Montpelier Hill in the Dublin Mountains. The tomb that was the subject of this project is located immediately behind the hunting lodge. Positioned at National Grid / Transverse Mercator: (Easting) 311496 (Northing) 223648, [Latitude: 53:251769 Longitude: -6:330298], at an elevation of approximately 383m above sea level. What is the nearest town to the Hellfire Club? Montpelier Hill is located in South County Dublin, approximately 12.8km southwest of Dublin City Centre and approximately 6km southeast of Tallaght and 6.5km south of Rathfarnham on R115 road to Glencullen. The easiest way to get to the Hellfire Club is by driving (access via the R115), as there is a carpark at the base of the hill. Though do be advised, that on a weekend (particularly on fine days) the carpark gets extremely busy and overflows onto the narrow roadways adjacent to the site. The nearest bus stop to the Hellfire Club appears to be the Dublin Bus Stop 6282 at Ballycullen Road (Hunter’s Avenue). This stop appears to be served by the Number 15 bus. From there Montpelier Hill would be around a 40–45 minute walk. Who owns the Hellfire Club? The Hellfire Club and Montpelier Hill are owned and managed by Coillte for use as a commercial forestry plantation and as a popular asset for public recreation. Is there a charge to visit Hellfire Club? It is currently free of charge to visit the Hellfire Club and Montpelier Hill, though please note that the carpark has a gate that automatically locks. There is parking for 70 vehicles at present, the carpark can be extremely full at peak times (weekends and fine summer days). You are advised not to leave belongings visible in your car unattended. The Hellfire Club Archaeological Project began through curiosity. I first visited Montpelier Hill back in October 2013, when I was writing a series of articles for TheJournal.ie to encourage people to visit Ireland’s wonderful heritage sites. One of the early articles was a Halloween Special, and featured a number of sites with a spooky or devilish reputation. The Hellfire Club is one of the very first places that comes to mind when you think of such a place, and so we took a trip to Montpelier Hill to visit the site. It was as we were walking around the building that my eye kept being drawn back to the undulating earthworks behind the Hellfire Club. These earthworks visible at the rear of the Hellfire Club building were identified as a Neolithic passage tomb. I had yet to research the site, and so although the earthworks certainly looked archaeological in nature, and was the right size and location for a passage tomb, I wasn’t certain at that time about whether it represented a megalithic tomb or another type of monument, or whether the mound was related to the Hellfire Club building, perhaps a spoil heap from demolition or quarrying. It was only when I returned to the office and searched on the National Monuments Service’s Archaeological Survey of Ireland (a truly wonderful asset to anyone interested in Irish archaeology); that I saw that it was indeed recorded as a passage tomb with the designation (DU025-001001), along with a neighbouring tomb that is all but invisible on site (DU025-001002). As I read more about the site, the story of the tomb’s demolition by William Conolly, who then suffered the devil’s wrath became a common theme. The more I read on Montpelier Hill the more I was really excited and fascinated by the stories, with tales of dark deeds and eighteenth century debauchery. However, underlying all of the folklore and myths was the possible tomb. Little was known of its story, or indeed of the story of the other passage tombs of the Dublin and Wicklow Mountains. These tombs appear to form an extended upland passage tomb cemetery, but the last investigations of these monuments were carried out before the advent of radiocarbon dating, and scientific techniques in archaeology. At the beginning of the project, we didn’t know how old the tombs of the Dublin and Wicklow Mountains were, or how they related to the overall chronology of megalithic tombs in Ireland. With a perfect combination of important prehistoric archaeology, a fascinating history, folklore, mythology and as a popular place to visit on the doorstep of Dublin; I began to consider the potential for an archaeological research project carried out to not only discover the nature of the archaeology of these monuments, but to highlight and inform the general public about the amazing story of Montpelier Hill. Another important motivation behind the project was the wish to demonstrate the practice and techniques of archaeology in an accessible and approachable way, where visitors (particularly local schools) were invited to come and ask questions, to see the dig progress and to learn about the ‘hows’ and ‘whys’ of archaeology. We hope that you will find all the information you seek about the Hellfire Club dig on our website. We have a full illustrated publication that you can enjoy for free – ‘Sacred Skies and Earthly Sinners; the Hellfire Club Archaeological Project’. You can also learn more about the methods and techniques that we employed, with the results of the dig and find out more about the artefacts. You can enjoy a gallery of wonderful images by local photographer Steven Duffy who was a regular visitor to the dig. You can follow the excavation through our site diaries. You will also discover the history, and the original name of Montpelier Hill. You can enjoy tales from folklore, myth and legend and the story of the Hellfire Club. Finally, you can meet the members of the organisation that Jonathan Swift described as a; ‘brace of monsters, blasphemers and bacchanalians’. The Hellfire Club is located on the summit of Montpelier Hill in South County Dublin. It is approximately 12.8km southwest of Dublin City Centre and approximately 6km southeast of Tallaght. Montpelier Hill is owned and managed by Coillte for use as a commercial forestry plantation and as a popular asset for public recreation. At present, it is free to visit, but the carpark can become full quickly at peak times during the summer weekends. Please Help to Share The Story of the Hellfire Club, Choose Your Platform!